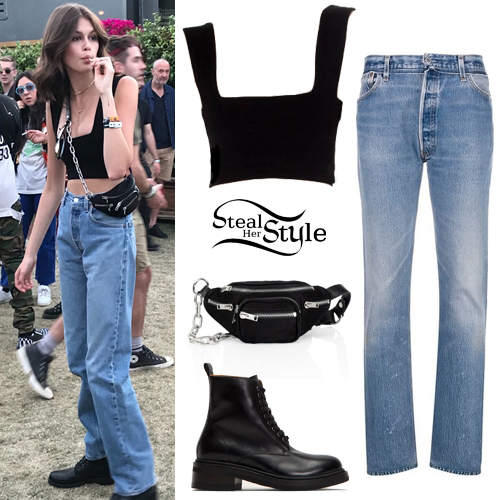 Kaia Gerber attended Coachella Music Festival – Day 3 wearing the Are You Am I Kimba Tank ($120.00), Re/Done Straight Leg Jeans ($343.00), Alexander Wang Attica Satin Mini Fanny Pack ($595.00) and Frye Alice Combar Leather Boots ($548.00). Emma Roberts was spotted out and about in Los Angeles wearing LoveShackFancy Shaye Floral Silk Top ($375.00), Re/Done Frayed Hem Cropped Jeans ($297.00), Clare V. Petit Alistair Bag ($345.00 – wrong color), Garrett Leight x Clare V. Sunglasses ($340.00) and Dior Baby-D Gold Tone Ballet Pumps ($890.00). 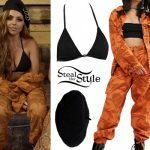 Ariana Grande posted some pictures on instagram wearing a top that look like the Are You Am I Miku Tank (Sold Out), Re/Done The Low Slung Jeans ($250.00), Burberry Sonny Vintage Check Belt Bag ($690.00), Kitsch Medium Rhinestone Snap Clips ($29.00) and Naked Wolfe Sporty Taupe Suede Sneakers ($199.95). 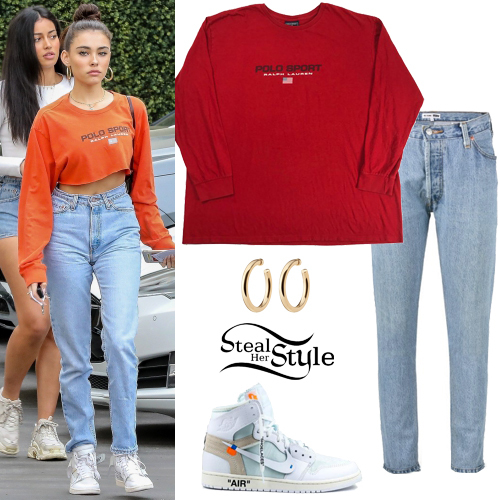 Madison Beer was spotted leaving Epione Clinic in Beverly Hills wearing a vintage Polo Sport Ralph Lauren Long Sleeve Tee ($65.62), Re/Done High-Rise Skinny Jeans ($174.00), Jennifer Fisher Baby Samira Hoops ($350.00) and Nike x Off-White Air Jordan 1 Sneakers ($2,043.64). Kourtney Kardashian was spotted leaving the studio in Calabasas wearing an Opening Ceremony Callipygian Printed Mesh Turtleneck ($95.00), Re/Done Double Needle Long Straight-Leg Jeans ($200.00) and Celine Madame Boots ($1,500.00+). Kaia Gerber was spotted out and about in Brentwood wearing a Line Spencer Striped Intarsia-Knit Sweater ($99.00), Re/Done High-Rise Loose Jeans ($250.00), Chloé Mini C Bag ($1,450.00), Bagatiba Mini Gold Hollow Hoops ($160.00) and Converse Chuck Taylor High Sneakers ($55.00). Kourtney Kardashian was spotted leaving church in Los Angeles wearing a 1960s Slim Tee ($78.00) and Levis Frayed High-Rise Straight-Leg Jeans ($320.00) both by Re/Done, Celine 01 Acetate Sunglasses ($500.00) and Adidas x Yeezy Powerphase Sneakers ($379.00). Madison Beer was spotted arriving at the AOL Build in London wearing a vintage Walt Disney World Mickey Mouse Sweatshirt (Sold Out), Re/Done Oversized Distressed Straight Jeans ($260.00), a vintage Christian Dior Boston Trotter Bag (Sold Out), Jennifer Fisher 2″ Lilly Hoops ($395.00) and Nike Air Force 1 Low Sneakers ($89.99). Kaia Gerber was spotted out and about in Paris during fashion week wearing a Khaite Petra Tweed Long Blazer ($1,520.00), Re/Done Stove Pipe Rigit High-Rise Straight-Leg Jeans ($240.00), Chloé C Mini Bag ($1,450.00), her Moncler x Palm Angels Fall 2018 Collection (not available online), Bagatiba Mini Gold Hollow Hoops ($160.00) and Jimmy Choo Cruz Crystal-Embellished Textured-Leather Ankle Boots ($1,295.00).